This toddler tool set is an excellent pretend play playset for your little one who wants to handle tools like daddy. The toolbox is sturdy and features slots to hold each tool in its place. Playing these toys can let kids know about hand tools, their shape, and how to use them in everyday life. Unfold the case to open a whole pack of tool collection! 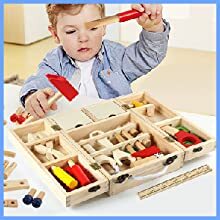 The wooden tool kit keeps your child organize his or her tools well, and with a handle on top, you can carry it everywhere. The toolbox size is 8.25 inches long * 3 inches wide * 11.6 inches high. It’s a valuable gift for Easter, Children’s Day, Thanksgiving, Christmas, and birthday. 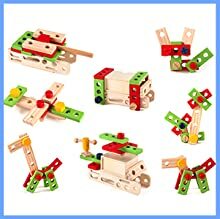 Use the tools and accessories in our construction set to build up different animals, aircraft, war machines, and many more creations. Let kids learn to use their imagination. This toddler set will take your little aspirational builder’s imagination to new heights! This kids’ tool set is made of premium grade basswood and non-toxic paint, which are safe, sturdy, and durable. The smooth edges of these tools (including the sawtooth) will prevent your kids’ hands from getting hurt. 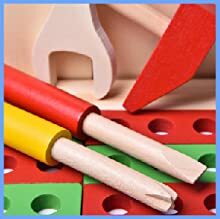 Parents would love the good source of materials and the fact that these tools withstand tough toddler play. GIFT: An awesome gift at any celebration for tool lovers. INCLUDES: Wooden toolbox set contains 43 pieces tools and accessories. FEATURES: Kids can build their plane, dog, caterpillar and wind turbine. Great DIY toy ready to practice little hands and fingers. 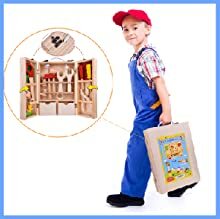 EASY CARRYING PACKAGE: The elegant wooden case makes this toy very storage-friendly. SAFE AND DURABLE: Tools are made with environmentally friendly materials, which are sturdy, durable, and safe.